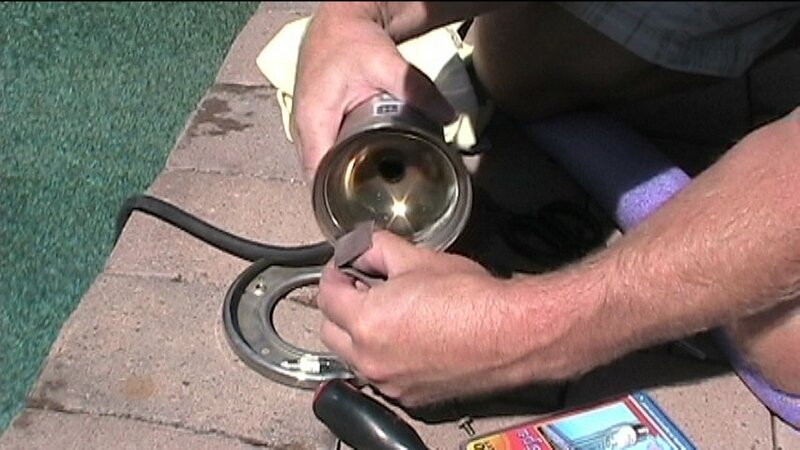 Replacing your lamp in your pool light fixture is something that can easily be done by the average home / pool owner as long as you have a skill set that includes the use of hand tools (screwdriver), and that you take all the necessary safety precautions prior to tackling the project (like ensuring that the power is off). My original post and accompanying video relating to this task was centered on getting right into the pool for the actual removal and re-installation of the light niche. I received many appreciative comments, as well as some criticism about how I went about the task. Most of the criticism came from pool maintenance and repair people, and the main issue was that in their opinion, it isn’t necessary to get into the pool to remove the niche. I did it this way for three reasons, one being that I thought it was the easiest way, and two, with the use of our underwater camera it was a good way to show how the niche is installed in the housing. The third reason was that I didn’t think I could reach far enough into the pool from the pool deck to reach the fixture screw. I still maintain that getting in the pool with a diving mask or goggles is the best way, but it really isn’t practical if it is off-season and the pool is too cold, and if you are a professional pool repair person, it would be a little strange to dive right into the client’s pool for repairs that can be done with your clothes on! I decided I would do another article and video showing this other suggested method. Take a moment to view the video. The complete instructions follow (below the video box). 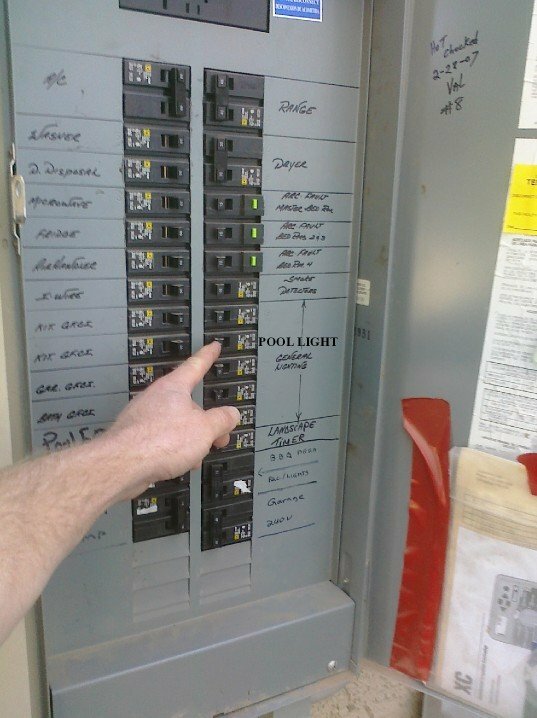 As with any project involving electricity, ensure that the power is off to the circuit you are working on. 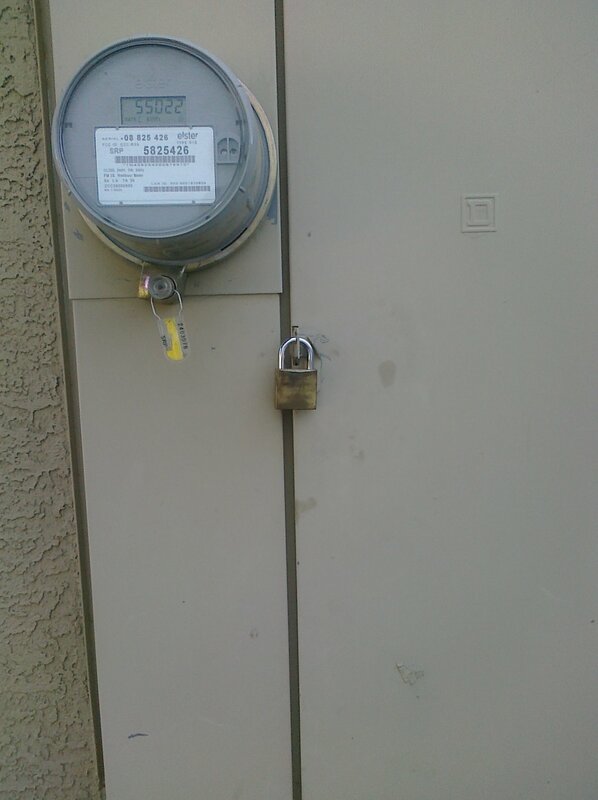 Identify the circuit that feeds the pool light and shut off the breaker, and lock out the panel if possible. The light niche (fixture) is held in place in the housing with one brass screw located at the top of the mounting / trim ring. To do this from the pool deck, get something comfortable to lie on as you will have to be face first on your stomach, and will have to reach quite far into the pool to reach the screw. It’s a good idea to wear swim goggles or a diving mask so you can put your face partially into the water to see what you are doing. It can be done by feel, but getting a visual look as well can speed up the process. The screw is over 1” long so hopefully once loose, you will be able to finish backing it out with your fingers only. 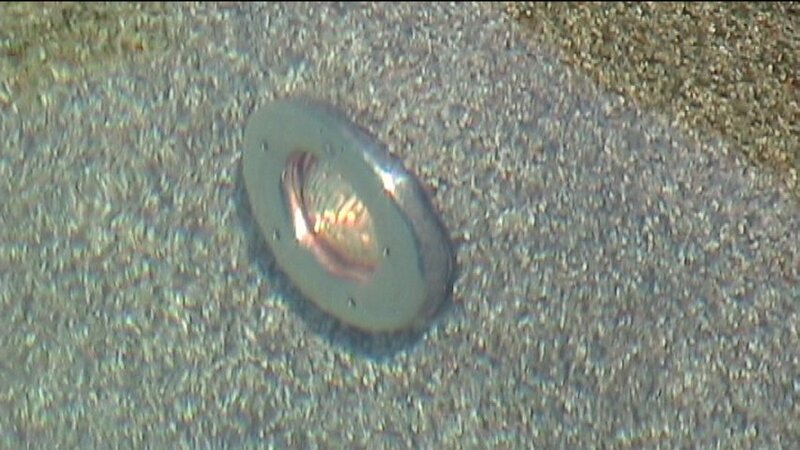 Once the screw is removed the niche should slide forward out of the housing, and have enough cord on it to allow you to bring the fixture right out of the water and onto the pool deck. Now observe how the fully assembled fixture looks before removing the screw that holds the assembly clamp together and separate the components of the fixture so that you have a good idea of how it needs to go back together. Back off the clamp screw enough to allow the clamp ring to come apart. 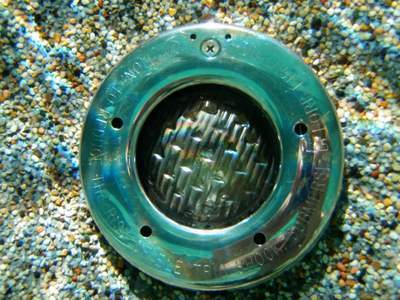 The interior of the fixture should be completely free of water. If not, then you have an issue that needs attention; either a defective water seal gasket, or a cracked, corroded, or bent fixture that is preventing a water-tight seal. If all is dry inside, then we can proceed. Remove the burnt out lamp and inspect the socket to see that it is clean, and free of obvious damage or corrosion. Upon inspecting the fixture, I noticed some hard water deposits that I cleaned up with some fine grit emery paper to make a smooth seal for the rubber gasket. My gasket appeared to be in good shape, free of deterioration, still soft and pliable, and free of any cracks or nicks, so I determined that replacement of the gasket wasn’t necessary. If there is any question as to the condition of the rubber gasket, replace it. If you haven’t already done so, get a replacement lamp of the same specifications as the one you removed. Remember you cannot exceed the maximum wattage of the rating of the fixture, but it is OK to put a lamp of a lower than rated wattage back in. New LED replacement lamps are also available (quite expensive), and changing to LED, or lowering the wattage will save on power and will likely last longer due to less heat generated by the lamp. I had previously replaced my 300W lamp with a 150W halogen lamp, and that light output is more than adequate for a pool of this size. Be careful not to touch the glass envelope of the new lamp with your bare fingers as this can cause premature deterioration of the lamp. Use a soft cloth or a tissue to install the lamp into the socket. At this stage, it’s a good idea to restore power to the circuit and briefly turn the light on and off to make sure you have a good connection. Don’t leave it on too long as the lamp gets very hot. Just make sure it works, and doesn’t burn out after a few seconds of operation. Then shut the power off again before continuing. Clean and dry all parts of the fixture assembly and lubricate the rubber gasket with some kind of approved O-ring or rubber gasket lubricant. When re-assembling the fixture, note that the niche will have something to indicate what is the top of the fixture (this one has an arrow), and the lens will also indicate where the top should line up. 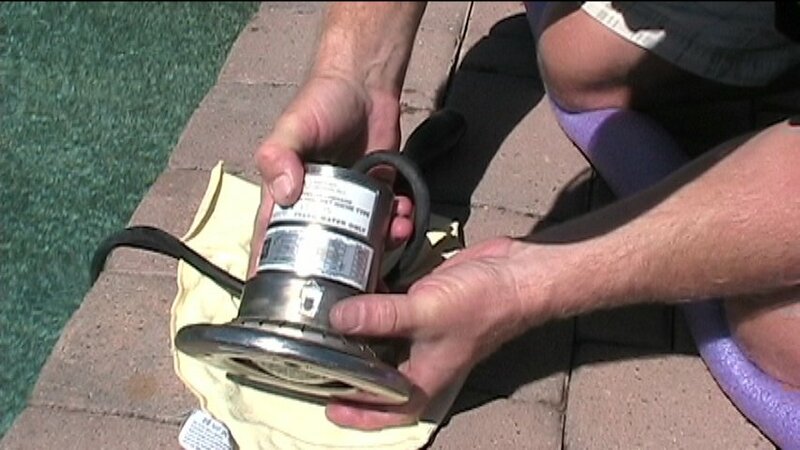 The gasket is marked as to what side should face the water. When putting the clamp back together, ensure that the clamp screw is on one side or another, but not at the top or bottom of the niche as this will interfere with the mounting tab (bottom), and mounting screw at the top. Wrap the excess cable around the light fixture, and work towards pushing the niche back into the housing. This can be tricky, but with patience, can be done. Make sure the mounting tab at the bottom is in place and then line up the mounting screw at the top, and start the mounting screw back with your fingers to hold it in place until you can get the screwdriver and complete the tightening of the screw. 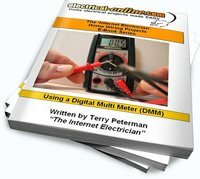 Restore power to the circuit and test your work! 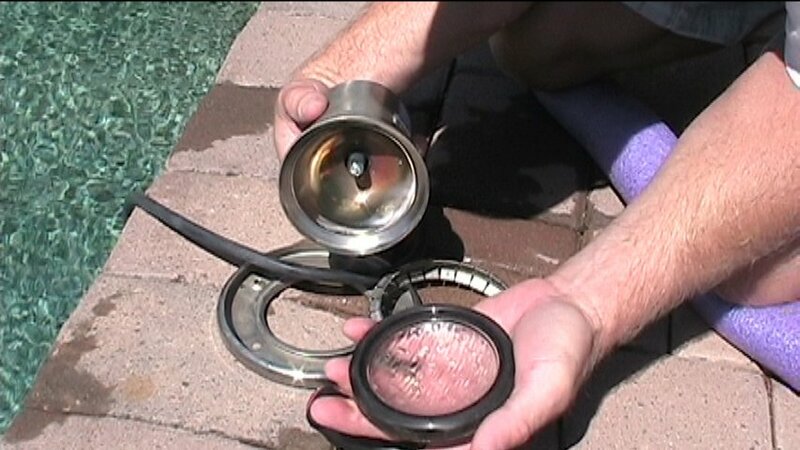 Now I’ve shown both methods of replacing the lamp in your pool light fixture, and you can decide which one is the right way for you. For myself, I prefer getting right into the pool to do the job, especially now since we’ve installed our Heliocol Solar Heat system. http://www.electrical-online.com/solar-pool-heating/. With the warm spring weather now here, our pool is as warm as we want it to be (90+F), and we’ve been using it for several weeks, while the neighbors patiently wait for the day that they can jump back in, probably sometime in May. 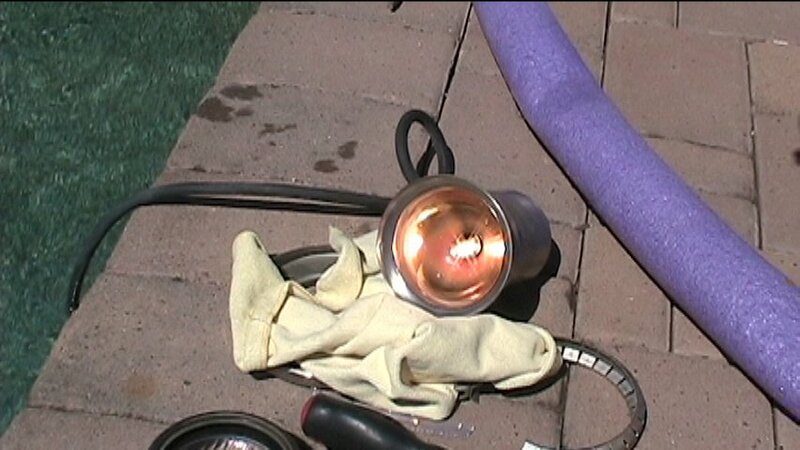 This entry was posted in How-To-Videos, Outdoor and tagged how to replace a pool light, pool light, pool light replacement, pool lighting, replacing a pool light. Bookmark the permalink.